Flounder falls into the category of flatfish and may be marketed under many different names. Summer flounder is sometimes labeled as fluke, while blackback and witch flounders are often sold as lemon or gray sole -- despite the fact that sole is a completely different species. Although available whole, you'll usually find flounder sold as thin fillets. This quick-cooking white fish offers a mild, delicate flavor that benefits from a variety of cooking techniques, including sauteing, baking, broiling, poaching and steaming. A light touch honors flounder's mild flavor and delicate texture. To keep its fresh, clean flavor at the forefront of your dish, select gentle seasonings. For example, you could pan fry fillets of flounder in olive oil and then finish with a bit of butter, capers and lemon juice. Alternatively, quick marinate flounder in soy sauce and garlic, and broil for just a minute or two per side, until the fish is opaque. Steam flounder fillets in a basket with fresh herbs and top with a squeeze of lemon for a light lunch served alongside a green salad and rice pilaf. Because its intrinsic flavor is so mild, flounder can also take on assertive flavors. Generously season flounder fillets with a Cajun or jerk spice mix, and then sear on both sides in a cast-iron pan lined with hot oil. You could use the seasoned fish fillets to make a po-boy sandwich with a creamy aioli or serve them alongside dirty rice and stewed vegetables. Intensely flavored pesto or red-wine sauces complement broiled flounder fillets seasoned with just salt and pepper. Place the fillets on a broiling pan and place under high heat for just two to three minutes per side. Top with a drizzle of your sauce of choice just before serving. For an elegant meal, layer a crabmeat filling on top of fillets and roll the flounder around the stuffing. Place seam side down in an oiled baking pan, and top with seasoning and a dollop of butter. Bake for about 10 minutes at 450 F -- until you see the filling bubbling and browning at the edges. The delicate meat of flounder contrasts well with a crispy outer coating achieved via frying or baking. You could do a traditional breading technique of coating the fillets in flour, then dipping in beaten egg and coating with breadcrumbs. Pan or deep fry the fish until the inside is opaque. For a lighter option, bread as usual but place the fillets on a greased baking pan and spritz a light coating of oil on the outside of the crumbs. Bake in a 375 F oven for 10 minutes, or until the coating is crunchy and the fish inside is cooked through. Serve over a fresh corn salad or with a refreshing salsa on the side. You could also wrap the crisped fillets in tortillas with shredded cabbage and sliced avocado for fish tacos. Bake flounder fillets with moist ingredients, such as canned tomatoes, to keep them from drying out. Place the tomatoes and other vegetables and seasoning, such as basil and oregano, in a baking pan and put in a 350-degree oven for 20 to 30 minutes. Alternatively, poach the fillets in the tomatoes on top of the stove. Sweat diced onion and garlic in olive oil, add the tomatoes and seasoning, and then top with the fish fillets. Cover and cook at a very low simmer for 20 to 30 minutes. Flounder also works with a technique called en papillote, in which you wrap the fillets in foil or parchment paper along with chopped vegetables, seasoning -- try fresh thyme and chopped garlic -- and butter. Place in the oven for 15 to 20 minutes, or until the fish is cooked through and the vegetables soft. Although not always readily available, whole flounder prepared by roasting maintains its fresh, delicate flavor, and cooking it on the bone keeps it moist. You'll rinse and dry the whole, gutted flounder and brush it with olive oil and seasoning. Place the fish skin side down on a lined roasting pan and place in a 425 F oven for about 20 minutes. Top with lemon butter or a tomato and caper sauce. 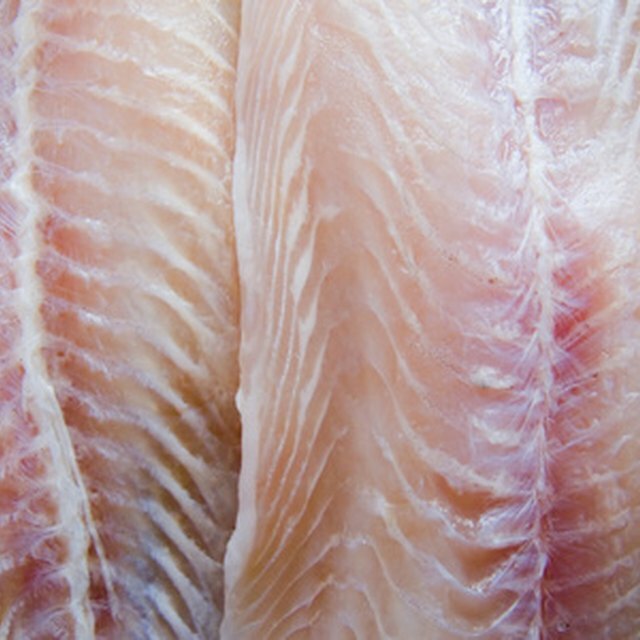 To bone the fish before serving, carefully remove the top fillets from the backbone and then slide off the backbone to reveal the bottom fillets. Flounder's low-fat nature makes it prone to drying out when cooking. Watch cooking times carefully, and select recipes that involve a marinade or sauce to help keep it moist. When you purchase flounder, ensure that it has a clean, non-fishy smell and, if whole, bright eyes and red gills. Whole fish are covered in a clear slimy coating -- if this coating has turned white, it's an indication the fish is not fresh.